Insects represent one of the most evolutionarily successful radiations of terrestrial animals dating back from more than 490 million years ago. However, since the early establishment of fruit flies (Drosophila melanogaster) as an experimental system, an event pivotal for modern genetics and molecular biology, tractable systems for evolutionary developmental studies within insects have been largely limited to species that represent very derived lineages within the insect phylogeny. In other words, the evolutionary history of insects has not been taken into account when model systems were established in the lab, mainly owing to practical limitations such as culturing methods and maintenance costs. Such scarcity of diverse insect systems tractable in a lab has thus negative implications for our current understanding of the key events underlying the evolution of insect novelties, such as wings, during their early radiation. Among other groups of animals, this limitation has been tackled by establishing culture systems of taxonomically diverse groups, with species that represent lineages strategically positioned within their phylogenies. For example, the establishment of lampreys, an extant group of basal vertebrates, and of urochordates such as the sea squirt Ciona (which belongs to a group that represent the sister lineage of vertebrates), as an alternative to evolutionary, developmental and genomics studies largely conducted in humans, mice, chicken, frogs and zebrafish, have been key to a better understanding of the transitions that enabled the evolution and diversification of vertebrates. It is worth noting, however, that such attempts to establish phylogenetically well-positioned systems can be deemed heroic, sometimes. For example, in addition to lampreys, hagfishes are the only extant jawless vertebrates that could be used to study the developmental and molecular biology of basal vertebrates. However, the majority of hagfish species are inhabitants of the deep ocean, and it took more than 100 years to establish the first culture of hagfishes in a lab that yielded embryos that comprehensively allowed the study of hagfish early development. In a new preprint, Isabel Almudi and colleagues at the Casares lab in the CABD (Sevilla, Spain), established the first continuous culture of mayflies (Figure 1), and also provided a wealth of transcriptomic data. Together with dragonflies (Odonata), mayflies belong to the most ancient group of winged insects, the Paleoptera. Figure 1. An adult male of Cloeon dipterum (Ephemeroptera: Baetidae). Photo courtesy of Isabel Almudi. Notice the extra pair of very large dorsal eyes, called the turbanate eyes – a striking sexual dimorphism in mayflies from the Baetidae family. However, all insects used in evolutionary developmental biology and genomics studies are positioned within a group of highly derived lineages, the holometabolans, including the fruit fly Drosophila, the beetle Tribolium and Heliconius butterflies. Therefore, the ancient placement of mayflies in the insect phylogeny allows for the interrogation of the early evolution of insects. In other words, mayflies represent to Drosophila what lampreys represent to humans. Almudi et al ‘s work is thus poised to illuminate the early transitions during winged insects’ evolution and test postulated hypothesis for wing evolution. Mayflies have two key distinct phases in their life cycle, the aquatic, which represents the nymphal stages, and the terrestrial, which represents the post-metamorphic (pre-imago) and the reproductive stage (imago). Mayflies also possess a remarkable diversity of adaptations, and their order (Ephemeroptera) is unique in that after the last moult the reproductive adults aren’t capable of feeding due to the presence of vestigial mouthparts, and thus die not long after mating (hence their order name, ephemera = short-lived). Almudi et al used an ovoviviparous species of mayfly, C. dipterum, collected in Southern Spain. Lines were established from single gravid females, which layed the eggs in a Petri dish. 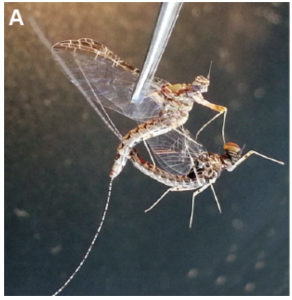 Usually mayflies mate during the flight, so forced mating (Figure 2) was attempted and spawning was induced within days until fertile eggs were layed (varying in clutches of 100-300 eggs, depending on the nutritional state of the female). In fact, such ease of pairing individuals represents a useful framework in which lines with interesting phenotypes/genotypes can be established. Future development of RNAi and/or CRISPR/Cas9 techniques in this system will be useful to test this. Figure 2 – Mating of C. dipterum in the lab. Top: female, bottom: male. From the preprint Figure 2a. Importantly, males and females are easily distinguishable, and nymphs feed on algae. Males are discarded after mating, and the induced spawning of females allows for a highly synchronised, high number of embryos being obtained for multiple experiments. 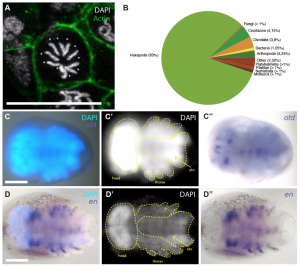 Establishment of the lines allowed Almudi et al to comprehensively survey the entire embryogenesis of C. dipterum, which takes around 15 days to complete. Moreover, transcriptomic data from a single male nymph allowed the de novo reconstruction of 117233 transcripts (Figure 3), a resource that will not only be useful for the design of riboprobes, RNAi and single RNA guides for CRISPR/Cas9 studies, but also for future phylogenomic studies. Ongoing work to sequence the C. dipterum genome, which consist in a karyotype of 2N=10, will help to foster the study of this emerging system in evolutionary developmental biology. Figure 3 – Transcriptomics in C. dipterum. (a) The karyotype of C. dipterum (2N=10), (b) transcriptome homology to other organisms, (c-d) In situ hybridization for orthodenticle and engrailed transcripts. From the preprint Figure 5. Almudi et al also push forward their system by showing preliminary data regarding the exceptional regenerative capacities of post-embryonic stages of C. dipterum. In fact, within 7 days nymphs are fully capable of regenerating a full leg (Figure 4), in contrast to one month in crickets and 18+ weeks in cockroaches. Therefore, C. dipterum could emerge as an attractive model owing to its extraordinarily fast limb regeneration capacities in post-embryonic stages. Figure 4. Full leg regeneration in a C. dipterum nymph within 7 days. From the preprint Figure 6. Despite the key importance of insects in agriculture, ecology, genetics and physiology, insect molecular biology has largely been restricted to the fruit fly Drosophila melanogaster, and is only recently expanding to other holometabolan insects, such as Tribolium and Heliconius. In this preprint, Almudi et al were able to move the field of insect evolutionary developmental biology forward by establishing a continuous culture of an insect that belongs to an ancient group, the Paleoptera. Such system will allow the comprehensive interrogation of testable hypothesis within the embryogenesis and post-embryonic development of a mayfly, such as the role of homeotic transformations in the early appearance of insect wings. Therefore, their system is strategically well positioned for testing postulated hypotheses about the evolution and diversification of insects, as well as emergent properties such as the extraordinary regenerative capacities of C. dipterum. 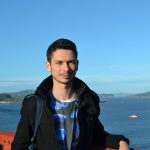 In the very style of tackling old questions proposed by Prof. Alejandro Sanchez-Alvarado, Almudi et al’s work thus aims to resolve “old questions by studying new species”. What were the key obstacles in establishing C. dipterum in the lab? For example, how did you realise forced mating was going to be necessary, and how hard was it to achieve a successful mating in the first time? What reasons led you to choose to culture a mayfly and not other paleopteran, such as dragonflies? At what stage are the eggs when they are laid? If mostly single celled, is it feasible to inject/electroporate constructs, or mosaicity is going to be a challenge to tackle in transgenic lines? The regenerative capacities you highlight in the preprint seem to be really extraordinary. Are there similar capacities in sub-imago adults? Do you have any evidence to say whether, mechanistically, regeneration is similar as to Parhyhale? Could it be related to mounting in nymphs? Ota, K. G., Kuraku, S. & Kuratani, S. Hagfish embryology with reference to the evolution of the neural crest . Nature 446, 672–675 (2007). What were the key obstacles in establishing dipterum in the lab? For example, how did you realise forced mating was going to be necessary, and how hard was it to achieve a successful mating in the first time? The most challenging step in establishing the culture in the laboratory was the mating. In those initial periods, we had the great help of David Funk, from the Stroud Water research Center, who advised us on the forced mating and culture conditions of our species C. dipterum. The first successful mating was a big achievement in the laboratory, until we saw it happening, we did not know exactly how it would look like. But the real breakthrough was the first clutch of nymphs we obtained from one of our mated females. It was an amazing moment in which we realised that we would be able to close the cycle and establish a continuous culture, an essential step forward towards the development of the projects we wanted to carry on. The Casares lab is mainly interested in the development and evolution of visual systems, so we did not only chose mayflies as our model, but Cloeon dipterum specifically, which belongs to the Baetidae family. This group inside Ephemeroptera exhibits a striking sexual dimorphism: males develop, in addition to the usual insect visual sets, -the compound eyes and the three ocelli-, an extra pair of very large dorsal eyes, called the turbanate eyes due to their turban shape. Thus, one of the projects we are currently carrying on in the laboratory is to investigate the genetic basis responsible for the appearance of this complete new visual system in C. dipterum males. As dipterum is an ovoviviparous species, once the eggs are laid, they immediately hatch as swimming nymphs. Hence, injecting single embryos represents a challenge. However, we are setting up maternal injections, which will permit us to deliver material (such as RNAi) to the entire offspring. Playing with the time we inject the gravid female, we will obtain whole mutant embryos or mosaics, depending on the developmental stage of such clutch. Nymphs easily recover from injections, so as an alternative to maternal injections, we are also performing injections on individual nymphs to obtain mosaic individuals. The regenerative ability of C. dipterum to generate its gills had already been reported by Dewitz as early as 1890! However no one seems to have picked it up as a regeneration model up to now. Regeneration depends on moulting, and therefore, sub-imagos should be able to regenerate, as they still moult once before reaching their sexually mature stage. However, the sub-imago stage is relatively short: after several hours the sub-imago moult into the imago (the adult), thus they are not able to complete the regenerative process. Nevertheless, we are investigating whether the first steps of the process- wound healing, blastema formation, etc.- can occur in sub-imagos. We have on-going projects investigating the mechanisms responsible for these great regenerative capabilities. Therefore it is possible that in the next future we will be able to answer if mayfly regeneration shares aspects with other organisms, such as Parhyhale or Grillus or they have specific mechanisms.